We carry Unique Caller ID Devices that you can use to help your customers improve their productivity by tracking and logging their calls. We've found that 2 Line Caller ID boxes with displays are not very useful! That's probably why you can't find them anymore. A multi-line Caller ID box with a display needs to indicate the line number the call came in on, on the display. That means that you have to actually look at the little line number, before you can be sure of who is on the line. Murphy's Law says that your customer's phone lines will sit idle for an hour - and then calls will come in on all of the lines at the same time! 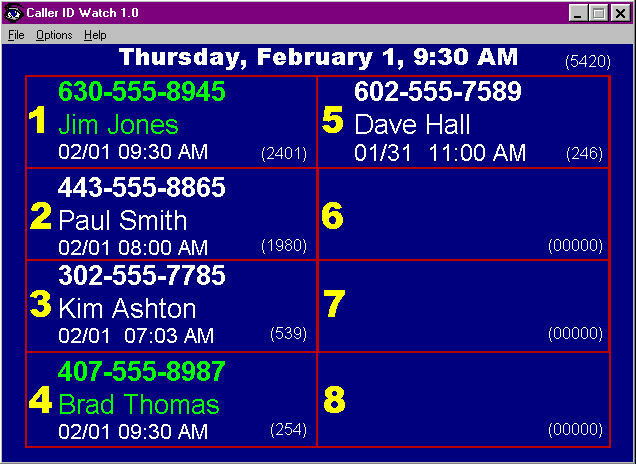 For the largest Multi-Line Caller ID Box in the world, our new Caller ID Watch program (below) is the only usable multi-line display we've seen. We actually use our Caller ID products in our own office! We've found that we can take quite a few more orders every day by using CTI (Computer Telephony Integration) to pop up the caller's account information as soon as we answer the phone. That's saved us a lot of money by requiring fewer telephone sales reps! 2 ports with a DB-9 Serial output to connect to a Serial Printer or PC! Has a 250 Call Buffer, to store calls until you download them to your PC - using any terminal program with a "Save to Disk" feature! It's like a Swiss Army Knife for phone lines! It will record whatever information your customer needs to know about his phone lines. A real problem solver! Actually records the digits dialed on INBOUND calls too! This means you can match the Caller ID number with the mailbox the caller dialed on a Voice Mail system. If he hangs up or doesn't leave a message, you can still call him back and know what he wanted! See any DTMF digits dialed ON INBOUND CALLS! Use this to verify what mailbox was dialed along with the Caller ID number! See the Time, Date and Duration of all calls... IN and OUT! Detailed real time data for On Hook, Off Hook, Flash and Ring Signals - allows for diagnosis of hard to find problems on PBX and Voice Mail systems. Detailed real time data for DTMF, Caller ID, On Hook, Off Hook, Flash and Ring Signals... Allows for diagnosis of hard to find problems on PBX and Voice Mail systems. 4 or 8 ports with a DB-9 Serial output to connect to a Serial Printer or PC! Can be chained together to cover 40 lines into ONE serial port! Actually records the digits dialed on INBOUND calls too! This means you can match the Caller ID number with the digits that the called dialed into a Voice Mail System. It's like a Swiss Army Knife for phone lines! It will record whatever information you need to know about phone lines. A real problem solver! See any DTMF digits dialed ON INBOUND CALLS! Use this to verify what mailbox number was dialed along with the Caller ID number! 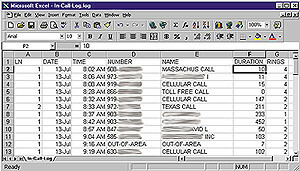 See OUTBOUND calls - records 25 digits (like beeper #s etc.) including * and #. Block or Allow up to 50 phone numbers from ringing through! You can also block PRIVATE and UNAVAILABLE calls. Programmable First Ring Suppression prevents calls from being answered before the Caller ID information is delivered (between the first and second ring). Comprehensive (very detailed), or simple data output formats. 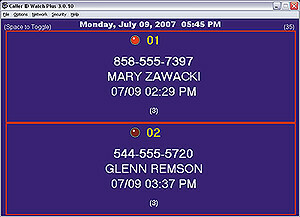 Pop up customer records on screen before answering the call. Allows for a few moments to review client's information before responding. Build prospect mailing lists for Call-ins. Criss-cross phone numbers with names and addresses. Call back customers that hang up during busy times. 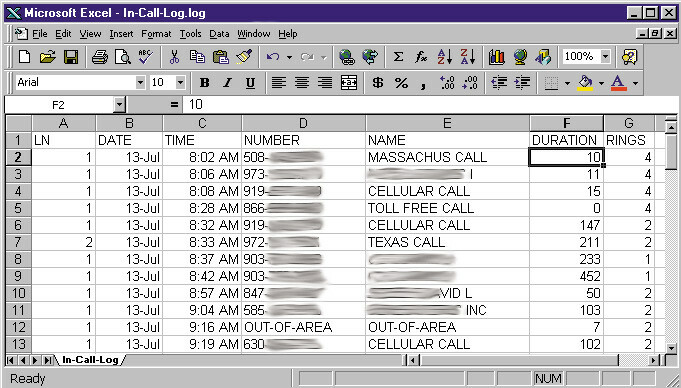 Unit logs every call whether answered or not. Save time taking orders. Bring up customer records and save precious seconds during peak hours. Automatically bill clients. Route date, time and duration of each call directly to your billing software. Determine the number of telephone personnel required. Track number of rings before calls are answered and duration of calls. Determine outbound telemarketing productivity. Calculate # of successful contacts vs. number of calls/total time on phone. 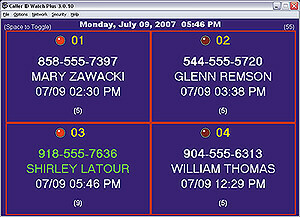 Track Interactive Voice Response (IVR) selections. Unit reports all digits dialed during a phone call. Increase modem/LAN security. Inbound hardware blocking prevents unauthorized access to sensitive data. Great BBS applications. Use Caller ID to verify new users, stop password sharing and discourage hackers. Deterring employee personal calls and unauthorized long distance usage. Cross check outbound calls with telephone bill charges. referred to as Caller ID Deluxe). NOTE: Special version available for foreign countries using DTMF Caller ID (name not available), or British / ETSI Caller ID. Mention you saw it on the Internet and get your first 4 Port box for development, at a discount! You can chain 4 and 8 Port units together to cover up to 40 lines. The clocks in these units are set by Caller ID signals, from the phone company. If you don't have Caller ID and just want to record DTMF, you can set the clock using a Touch Tone phone, and the Battery Backup will retain the time if the unit gets unplugged. Same features as 4 Port unit, chains with 4 or 8 Port units to cover up to 40 lines. 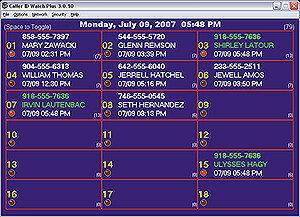 HUGE Multi-line Caller ID Display for our Serial Caller ID Boxes! and runs on just about any old PC and Monitor you have laying around! Uses the full 640x480 screen. Looks great on a 14" monitor, is huge on a 17" monitor. Requires one of our 2, 4 or 8 Line Serial Caller ID boxes. Requires a dedicated Windows 95 or 98 PC, minimum 486-66 with 16meg of RAM, a serial port, hard drive with 10 meg free and a VGA Monitor. It would be a waste to use a new PC with a lot of RAM, an expensive monitor, and an expensive operating system like XP! An old $100 used PC should work fine. CALLER ID WATCH PLUS NETWORK - Up to 80 LINES! You can also see the Caller ID on any Windows PC on the Internet! See 2, 4, 8, 18 or 40 lines on a screen at once. Hit the SPACEBAR to see the next screen - up to 80 lines. Works with any Windows PC on the Internet! I can see what's happening at the office from my laptop and home using wireless cellular data (I use Verizon). 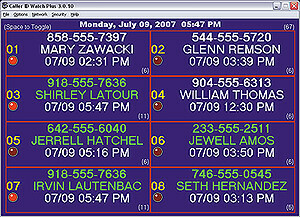 With the Full Feature Caller ID Box you can see when a line is busy (the red LED lights), and you can see outbound calls - including the number dialed. All call information is logged to a flat file, which can be imported into Excel or Access to be sorted any way you need it. Installation requires some knowledge of Windows networking, including IP addresses. Requires an 800x600 or larger monitor. Phone Number (with or without dashes) or the Name to the PC's Clipboard. to paste the Name or Number into your program. Know who's calling without even looking at the screen! When a new call comes in, you can tell Caller ID Watch Plus to talk to you! It will tell you the Line Number, the Name and/or the Phone Number. CLICK HERE to listen to Caller ID Watch talk! You can turn the speech on or off on any PC, but it even talks on a PC anywhere on the Internet! The Network Setup Wizard makes it easy to install on a network. For use outside the network on the Internet, instructions on opening a port on your firewall are included in the Help Section of the Caller ID Watch Plus. 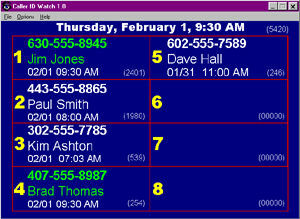 Up to 80 LINE Caller ID Display for our Serial Caller ID Boxes! 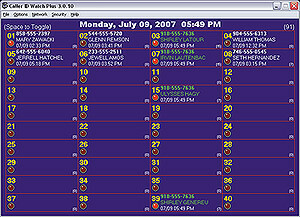 80 LINE Caller ID Display shows 2, 4, 8, 18 or 40 lines at a time (SPACE toggles to the next screen of lines), and runs on just about any old Windows PC and Monitor you have laying around! Requires Windows 98 or up, minimum Pentium 100 with 256meg of RAM, a real serial port (not a USB/serial converter), hard drive with 200 meg free, a Super VGA (800x600 minimum) Monitor, and a NIC (Network Interface Card) if you plan to use it over a network or over the Internet. The voice features (spoken Caller ID) require a sound card and speakers. 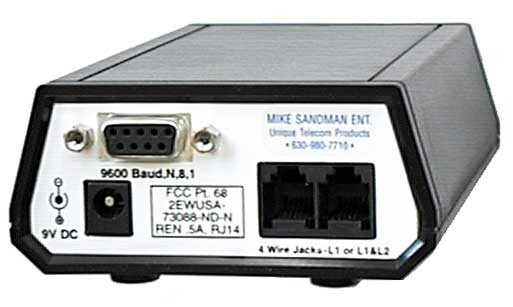 Comes with a Dongle that connects to the serial port on the PC that's collecting the data from the Caller ID Box. No limit on the number of client PCs. 1. If the information you need from Caller ID Watch Plus is important to you, you should probably run it on a dedicated PC. If other software on the PC crashes Windows, you'll lose the information until the computer is reset. Even old versions of Windows (like 95) do an incredibly good job if there is only one program running on the PC. Be sure to remove everything from the Startup Group, and stop the Virus Scanning software on that cheap dedicated PC. 2. Caller ID Watch Plus Network uses UDP Packets which are not absolutely guaranteed to get to the client PC. In reality, we haven't seen dropped packets on the network, but you shouldn't use the network for life safety applications. Even if a packet gets dropped over the network, the main PC collecting the Caller ID information will have all of the information in its log. To get the UDP packets outside of your network, you'll need to choose a port for them to be sent on, and that port will have to be opened in the firewalls. 3. 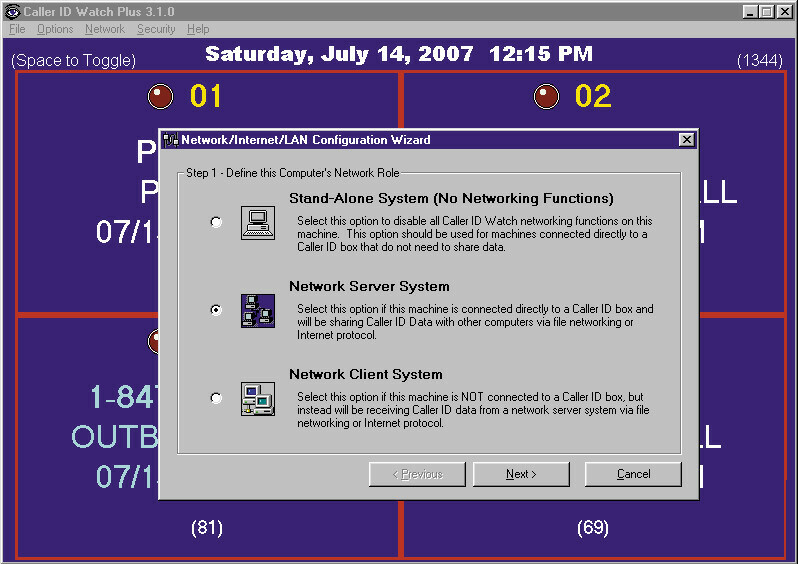 If you plan to view Caller ID information over the Internet from a PC that has a dynamic IP address (that changes often like residential cable, DSL or a cellular phone data connection), you'll have to click on the Network Setup Wizard each time the IP address changes to send the new IP address to the main PC running Caller ID Watch Plus Network. That takes about 10 seconds. 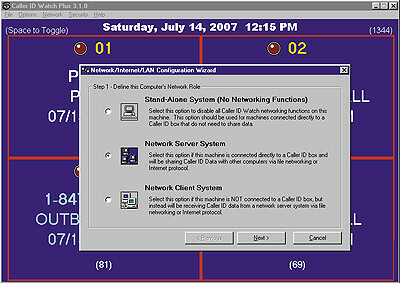 Plug your Whozz Calling (Full Feature only, but not with Memory/Modem) into a serial port on your PC, and it will record all activity, including outgoing if you have a Full Feature unit, into a flat file on your hard disk. It starts automatically with windows. Everything is time and date stamped. 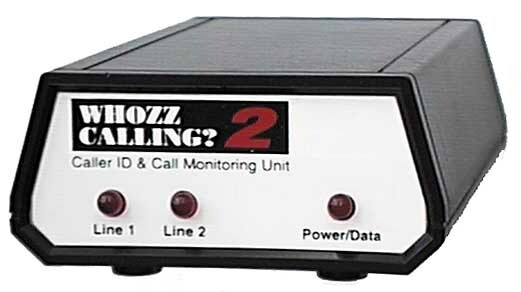 For incoming calls, the program leaves the last Caller ID number received in a separate file for each line (like whooz01.dat, whooz02,dat, etc.). If you want to bring Caller ID into a custom written program, you simply have the program open the small flat file for the appropriate line number, when you want to do a screen pop for that line. It's usually easier to read and parse the information from a file, than to read the serial port (which is what Caller ID LINK does for you). You might even be able to read the flat file from a regular database program (like Access). Since you never know which line you need to answer (Murphy's Law says that more than one line is going to ring at the same time), your program needs a way for you to tell it which line you're going to answer, so it will pop the correct information. If you have 12 or fewer lines, the F Keys (above the numbers on a keyboard) are the easiest to use (if your program doesn't already use them). You may also be able to use a two key combination, like SHIFT and the F Key. This works best on a Square Key System (where all of the lines are the same line number on every phone). That way, someone can hit the F Key even before they answer the line, to see who's calling. On a PBX, you could hit the F Key after the line is answered, if the line number is shown on the phone's display. Requires Windows 95 and up, a PC with a minimum 486-66 with 32 meg of RAM, a serial port, hard drive with 10 meg free, and a Network Interface Card (NIC) so other computers on the network can access the Caller ID data. This PC becomes the Caller ID Server.